Blogging can be a bit of a lonely pursuit. So when there’s an opportunity to meet and chat to fellow bloggers and eat some delicious food, I’m there in a hot minute. 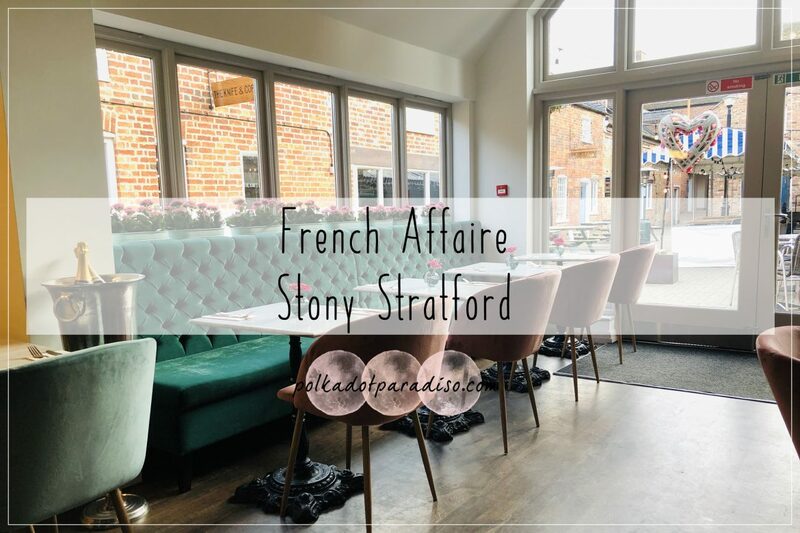 The latest event that I was able to go along to was at the beautiful French Affaire in Stony Stratford. Stony Stratford is a beautiful little town just outside Milton Keynes. I love the towns on the outskirts of MK as it’s usually where the independent shops and restaurants are. Stony is no exception and at the end of last year, French Affaire opened. Set back from the high street in Odells Yard this lovely little building looks welcoming and ready for summer, with seating outside the front. Inside you’ll find a beautifully decorated space with a high attention to detail across all the decor. The moss wall was a particular highlight. I touched it, and it is in fact real! Teal is one of my favourite colours, so I was always going to like the decor here. To welcome us we were served some delicious fizz to enjoy while we mulled over our order. With both savoury and sweet crepes on the menu, it was tough to choose! I decided to be good(ish) though and opted for the smoked salmon and cream cheese with capers. Although the Rocher Extravagance sounded amazing (at least I already know what I’ll be eating next time). While we were waiting for our food, the team served us some delicious appetisers. The Salade de Boeuf (the one closest in the picture) was my favourite. I think I had three (maybe even four?) of those. In the middle was duck pate and at the back we had aubergine caviar. This was delicious and the capers went with it beautifully. Sometimes I can find smoked salmon and cream cheese a bit rich but it all came together nicely. While I was enjoying my pancake, I must admit I was eyeing those that went for the sweet option with some serious green eyes. If I wasn’t so full, I would have ordered a sweet one for dessert! We finished up with a tea or coffee. I went with a decaf Americano. I’ve been drinking terrible coffee from my work canteen for so long I think I’d forgotten what good coffee tasted like! Whilst sipping this I was struck with just how well the decor was put together here. The consistency of the copper from the cutlery to even the little milk pail was a lovely touch. Mixed with how the rest of the restaurant was decorated just made for a truly inviting experience. I really enjoyed my late lunch at French Affaire. The team were lovely and the owner gave us a warm welcome on arrival. I’ll absolutely be returning to sample the sweet crepes soon. They also have an evening menu that they run on Friday and Saturday evenings. If you’re planning to be in the Milton Keynes area – this is one place to make a bee line for!